Cornered by a straightforward question he did not want to answer, the head of the Council on American-Islamic Relations (CAIR) Los Angeles office chose instead to misrepresent his organization's actions and feign outrage that the question itself was bigoted. "Will CAIR-Los Angeles or CAIR-National – will you condemn Hamas?" Hussam Ayloush was asked outside his chapter's annual fundraising banquet Saturday evening. Initially, Ayloush tried CAIR's standard response, saying he condemns "any group ... who engages in the harming of civilians, innocent people." That sounds like an answer to the question, but avoids specifically addressing whether Hamas is included. Then the deception and intimidation kicks in. You can see the full encounter by clicking on the video frame below. Ayloush's claim that CAIR is "not here in the business of being dragged into the Middle East affairs and the conflicts of the Middle East" is beyond disingenuous, given how often CAIR chooses to weigh in on Middle East issues. Its statements on the Palestinian-Israeli conflict always condemn Israeli actions. If Hamas is referenced at all, it is to minimize the threat of attacks by Hamas, a group which rejects any peaceful settlement to the conflict and which vows to destroy Israel. For example, CAIR held a news conference in Washington to condemn Israel's 2008 "Cast Lead" incursion into Gaza aimed at stopping rampant Hamas rocket attacks targeting Israeli civilians. CAIR co-founder and Executive Director Nihad Awad didn't need to be "dragged into the Middle East" debate. He demanded "that our government, the U.S. government, take immediate steps to end the immoral and illegal Israeli bombardment of Gaza and its population." Ayloush made a nearly identical statement during a Southern California press conference, demanding that "our government take immediate steps to end the immoral and illegal Israeli bombardment of Gaza." When the rocket fire continued unabated, Israel again took military action last year to protect millions of civilians who continually were sent scurrying into bomb shelters. Ayloush seemed more than happy to get into the business of Middle East conflicts, appearing on a Los Angeles television station to place the blame solely on Israel and minimize Hamas's culpability. In 2004, CAIR issued a press release condemning Israel's targeted killing of Hamas founder Ahmed Yassin. The statement never mentions Hamas or Yassin's role as a Hamas founder and leader at a time when Hamas conducted waves of suicide bombings. Rather, CAIR "condemned the assassination of a wheelchair-bound Palestinian Muslim religious leader, calling it an act of 'state terrorism.'" The question about CAIR's attitude toward Hamas is more than fair game given the organization's roots in a Muslim Brotherhood-created Hamas support network in the United States. Internal documents seized by the FBI show that Awad participated in a key meeting of support-network members, known as the Palestine Committee, which was called to discuss ways to "derail" U.S.-led peace efforts between Israelis and Palestinians. The meeting, secretly recorded by the FBI, included talk of how a new accord would marginalize Hamas and lead to Palestinian recognition of Israel's right to exist. 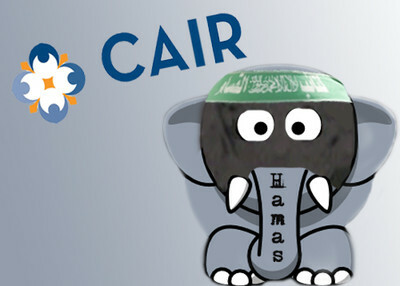 CAIR was created after that meeting, and quickly appeared on an agenda among the Palestine Committee's other branches. Awad also was listed in a Palestine Committee telephone list. Ayloush is not a stupid man. He knows this history, and he knows that a federal judge in Texas who saw the evidence found "ample evidence to establish the associations of CAIR, ISNA, NAIT, with NAIT, the Islamic Association for Palestine, and with Hamas." His options, therefore, are to acknowledge that record and perhaps try to claim that CAIR has changed, or to bluster his way into changing the subject. On Saturday, he chose the latter. Ayloush pretended those court exhibits simply don't exist and claimed the FBI's decision to shun CAIR is "just part of the politics of civil rights in America." "For you to ask that question," he said, "it's almost there is an assumption that an American Muslim somehow accepts terrorism or condones terrorism." The question does nothing of the sort. It's clear from the video that the questioner was asking specifically about whether Ayloush and his organization condemn Hamas for its terrorist acts. At no time was Ayloush asked to answer for the broader Muslim community. We've shown how bogus accusations of "Islamophobia" are used as a shield by CAIR and other Islamist groups to duck difficult questions. Questions about whether CAIR would condemn organizations by name unequivocally, instead of qualifying the condemnations, were just "word games from the pro-Israel lobby," Hooper said. Instead, Hooper said that the very questions were the problem, and part of a Zionist conspiracy. "This is a game they play," Hooper said, referring to the pro-Israel lobby. "They give me a long list of people to condemn and if you don't give sufficient condemnation you're a terrorist. We would condemn any person or any group that kills innocent civilians. But it's not my duty that when the pro-Israel lobby says 'Jump' I say 'How high?'" And this is standard behavior for Ayloush. In January, he criticized the documentary "Jihad in America: The Grand Deception," by Investigative Project on Terrorism Executive Director Steven Emerson, claiming that it promoted intolerance of Islam. Emerson responded, pointing out that "Ayloush failed to make a single reference to [the film's] content" but chose instead to make ad hominem attacks. Emerson even proposed a public meeting in which Ayloush could discuss the film's actual content. Eleven months later, we're still waiting for a response. But the question of whether CAIR condemns Hamas as a terrorist group is one that likely will never be answered. Glenn Greenwald seems to be a CAIR fan. He does speeches for them at their events, etc. People should tweet @ggreenwald and email him at Glenn.Greenwald@riseup.net asking why he does activities with an organization that refuses to condemn Hamas terrorism against Israeli Jews. If CAIR does not weigh in on Middle East issues, why are they co-sponsoring a pro-Palestinian event in Irvine on December 7 along with MPAC, MAS, the MSA and Jewish Voice for Peace? The speakers are a co-founder of Electric Intifada and UC professors Hatem Bazian, Sohail Daulatzai and Gabriel Piterberg-professional Israel-bashers all. And what about that speech Ayloush reportedly gave in front of the Israeli consulate in April 2004 while MSA students from UCLA were reportedly shouting, "Death to Jews"? Ayloush might want to re-think his comments. Isn't this just typical Islamist rhetoric? Obfuscate, deny, lie, obfuscate, deny and lie again. The left libtard, no brainers eat that stuff up.